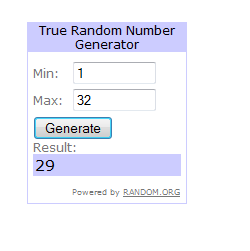 Winner of Lulupu 200 blog Followers giveaway! Please contact us with your address at hello@lulupu.com within 48 hours to claim your price! 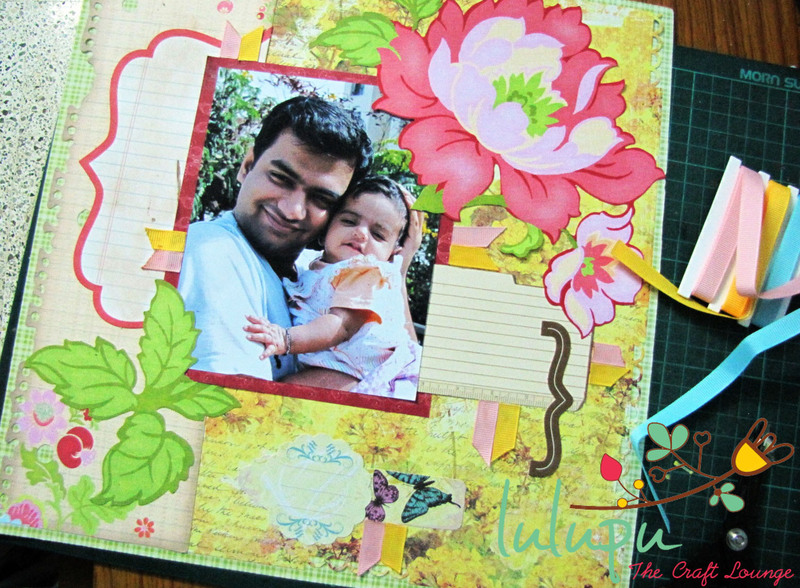 A Scrapbook Layout from Scraps !! Good Morning beautiful Crafters !! Here is my Layout have a look. What do you think ? A layout which is super easy to do and quick too. All you need is your Pattern paper scraps and few punches . 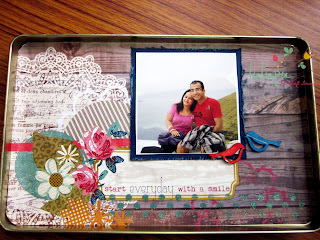 I have a quick pictorial here sharing the details how I did my Layout. Tools and pattern paper scrap !! You can find the link to the products at the bottom of the post . I have used all the scraps so far I have from my kit . 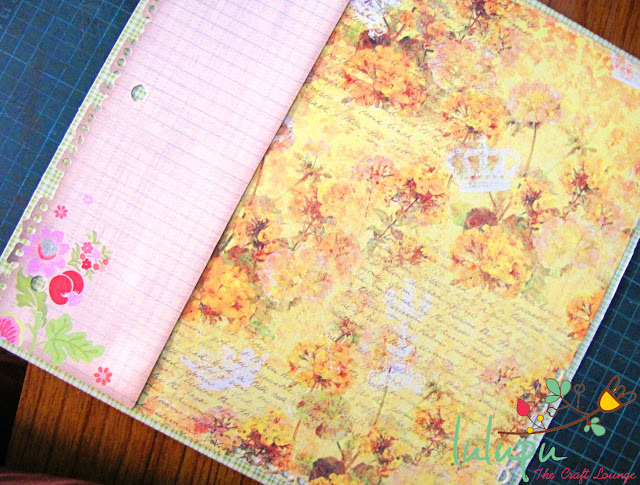 Few were my all time favorite - papers from Tigerliliy paper pad , & Polka dotted pattern paper from Prima Zypher. For background I have taken a plain white card stock measuring 12x12 . I have added two layers of colors since it was looking dull in my first attempt . 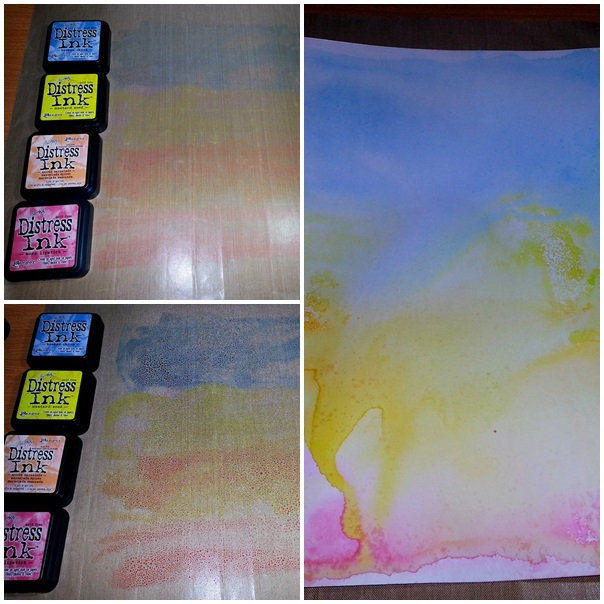 You can take any color you want .I cannot do anything until and unless I use Distress Inks- All time favorite. 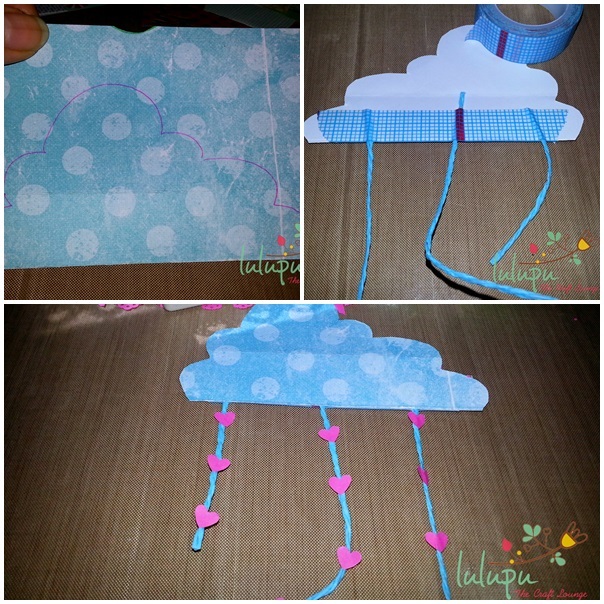 I have first drawn the clouds roughly you need not be to perfect for this :P and fussy cut . 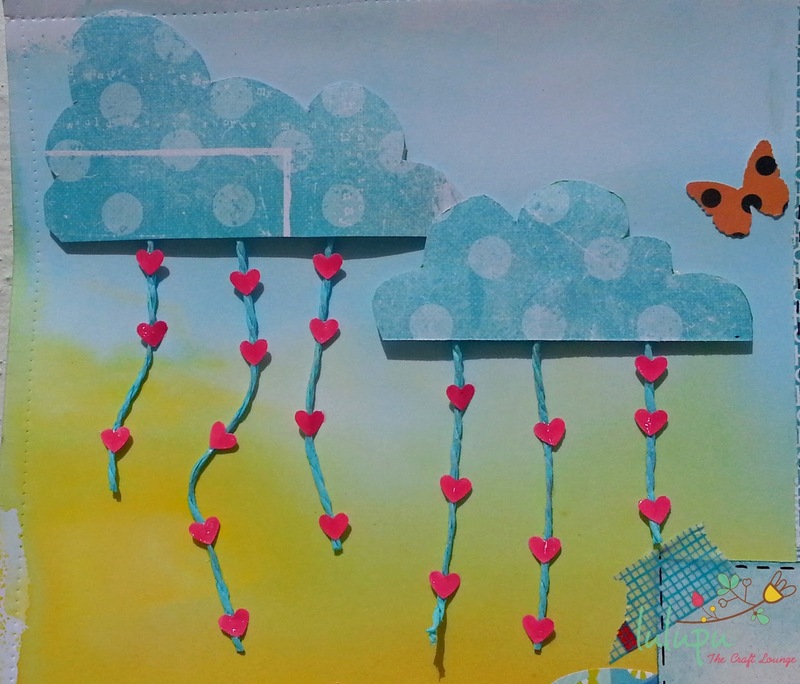 Secondly , I have pasted these strings using washi tape and thirdly pasted these cute little hearts over the strings. Now there you can see the oval punch . I have used the double sided pattern paper to make banner , and trees . 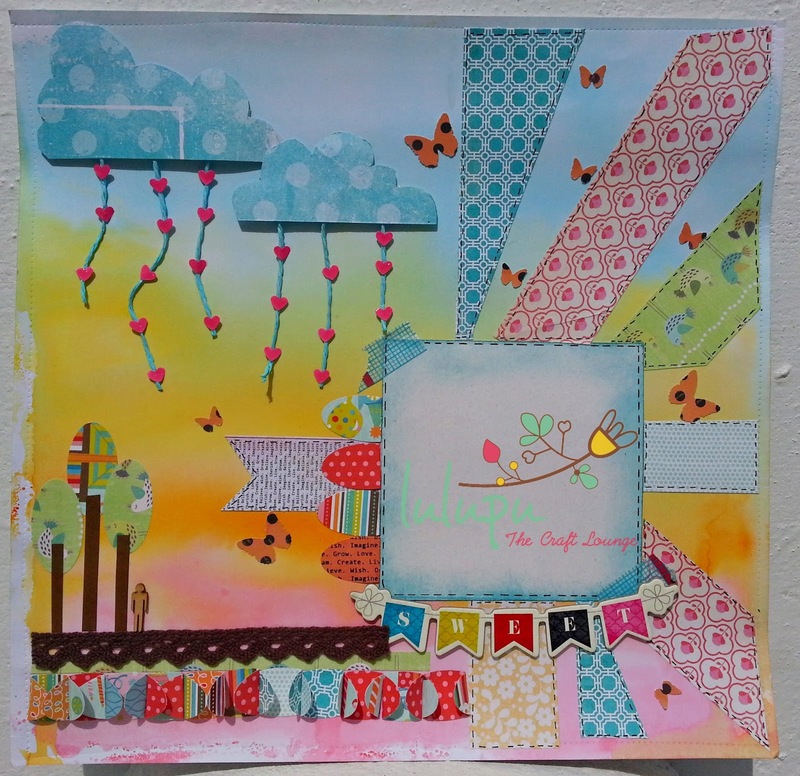 Sweet banner is a chip board die cut perfect to go with this layout . 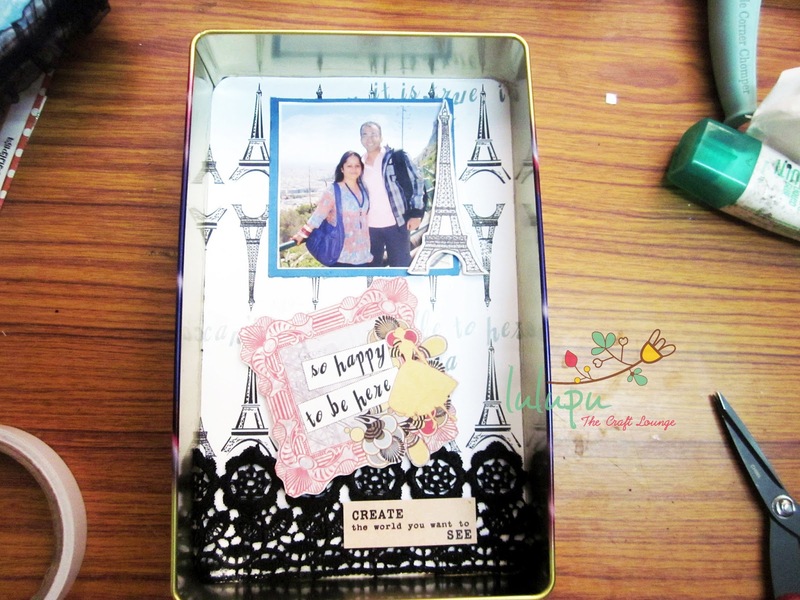 I have pasted the oval scraps next to the picture to make them look like mini tabs , I find them really cute and adorable . And Lastly I have used the scraps strips like sun rays spreading the happiness all around . 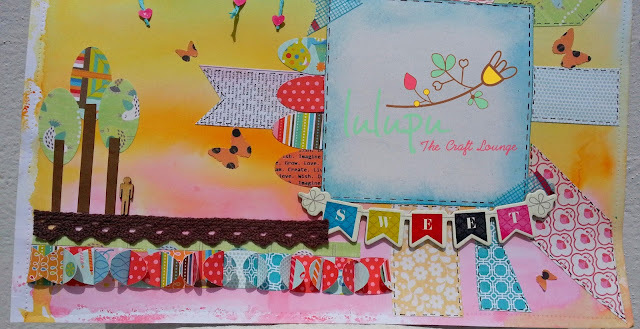 All in all a cute and vibrant layout all from your scraps . Hopefully I was able to Inspire you all. If yes , do pick up some fun techniques from the post and enter you project in this month's challenge hurry !! Hello Peeps!! How has your Sunday been so far?? My patience was being tested by YouTube since morning while trying to upload the video for this post.. Hence the delay.. But it's alright... The video is finally up and I am here to talk about two things. #24 - Bendy Minds Achu!! Congratulations!!! 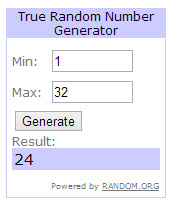 Please contact us at hello@lulupu.com within 48 hours to claim your prize. Hi people! As you know for the second part of this month, the design team is focusing on "Maximizing pattern papers". So for my inspiration for today is : Making most of your double sided patterned papers and make your own embellishments with PP. Now back to today's post. I made this cute little favor bag with a 6x6 MME Blink of an Eye paper pad. When I was thinking for ideas for making the most of patterned papers, I thought in the reverse order. Which are the products where I would want to have the design show on the inside as well. So I came up with the idea of a favor box. I guess these are one of the best uses of double sided PP, as you not only want the bag to look pretty on the outside, but also want it to have some color and design on the inner side. 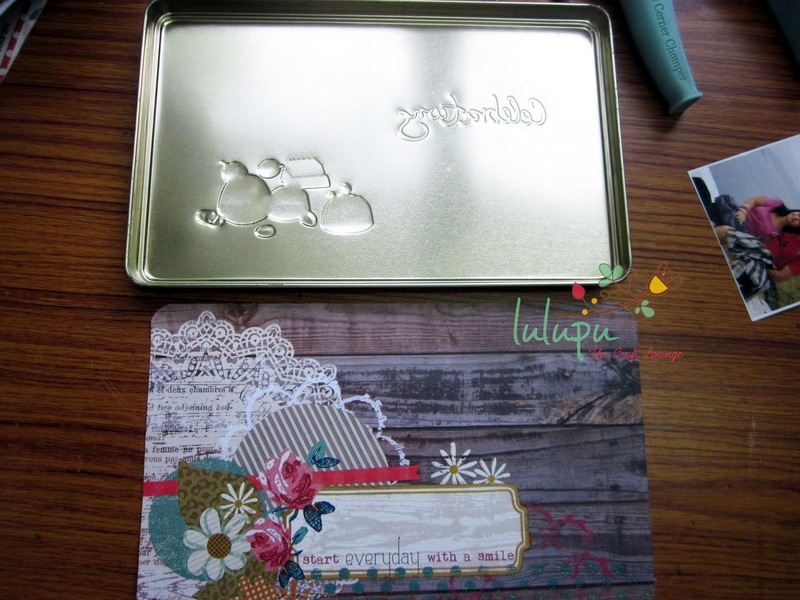 Product Review - Mod Podge! Hope you are all well and enjoying the month here at Lulupu with lots of inspiration from the fabulous members of the design team. As you know, my term at Lulupu is coming to an end this month and this is my last post as the Design Team member here, I would like to thank everyone who is a part of Team Lulupu - the owner and a good friend Karuna, our sweet blog coordinator Nikita, all the fellow design team members Snehal, Isha and Indira and all the wonderful challenge participants and readers for all the love and appreciation they have blessed me with over the course of last 6 months. Working here has been a wonderful opportunity with so much to learn and something new to look forward to every month. It has been a beautiful ride! Lulupu is now looking for new team members. 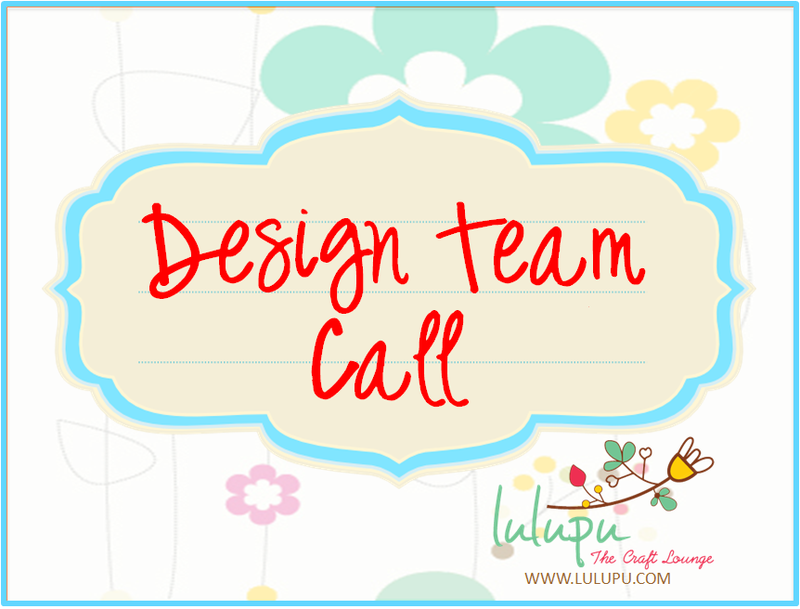 If you think you will be a good match for Lulupu team, today is the last day to apply for the Design Team. Find all the details here. - it can be used on ANY porous surface - paper, wood, cardboard, chipboard, fabric, cork and more! - it is non-toxic and that means it is safe for kids to use and have fun creating their little art works. - it protects your surface from moisture and acts as a sealer. So while I wouldn't want to dip my mod podge covered art work in a bucket full of water, it does gives me the option to wipe of the dust from my art work every now and then with a damp cloth. - it comes in variety of formulas/finishes that allows you to use it for pretty much everything imaginable. Let's talk a little about the variety of finishes/formulas that the Mod Podge range offers and what's the difference between each. 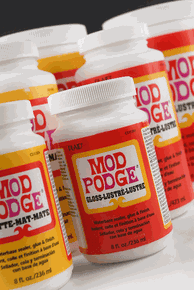 Classic Mod Podge: This is an year round Mod Podge that works for all types of projects and most surfaces. Comes in gloss and matte finish. 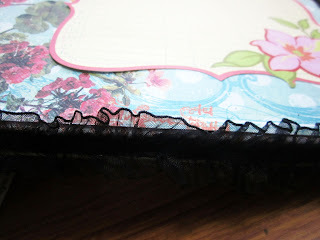 Satin Mod Podge: This is just like classic mod podge only difference being the satin finish. It gives a lustrous, soft appearance somewhere between a matte and gloss. 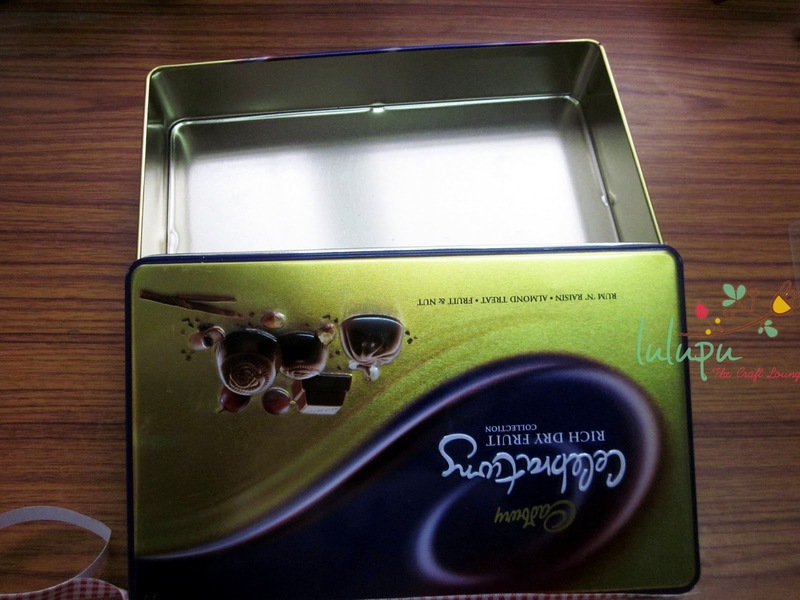 The scratches are less visible on satin surfaces when compared to gloss or matte. 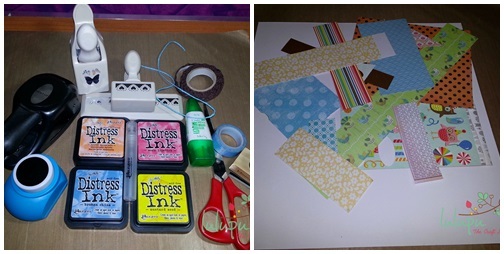 Fabric Mod Podge: This is specifically used to prepare fabric for decoupaging to surfaces and for decoupaging things onto fabric. It eliminates fraying. Paper Mod Podge: This formula was created for more advanced paper projects, such as scrapbooking. It also comes in a gloss and matte finish. 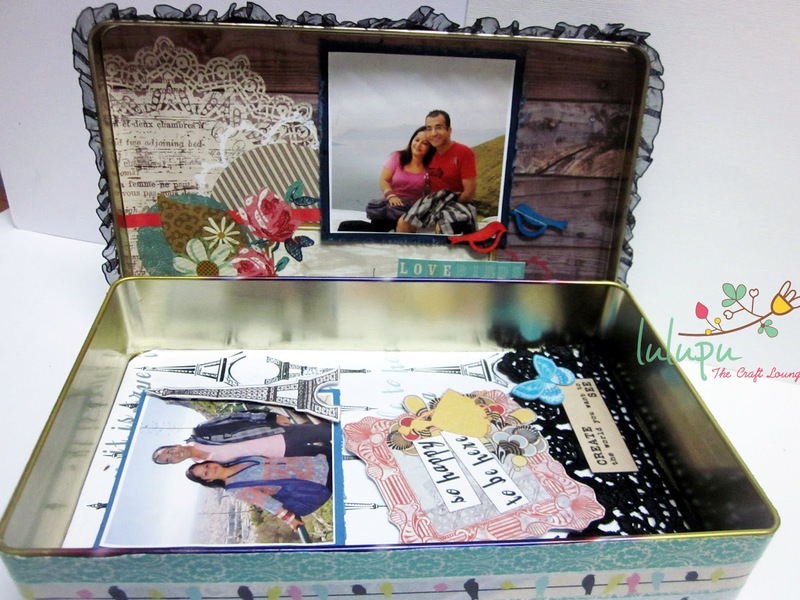 Paper Mod Podge keeps photos and papers from yellowing and it extends the life of scrapbooking projects. Hard Coat Mod Podge: This is mostly used for furniture. It has an extremely durable finish and it provides extra protection for projects that are used and handled more often. It also has a satin finish so it doesn’t show scratches and marks like the gloss or matte. Outdoor Mod Podge: This formula protects your projects from moisture and other elements, which makes it great for clay pots and other outdoor creations. For added durability, it is recommended to also use an outdoor sealer. Brushstroke Mod Podge: This formula gives you the look of a hand painting. It’s very textured and dimensional. It also comes in a clear gloss or matte finish. Kids Wash Out Mod Podge: It is specially designed for children to use. Parents will love this one because it will wash out of children’s clothing and furniture with ease. This formula also has a glossy finish. 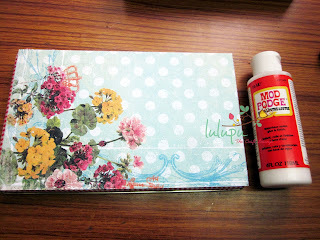 Glow in the Dark Mod Podge: For the best glowing effect, you’ll need to apply several coats. It’s great for children’s projects. You can’t really see the finish, but it glows-in-the-dark! Expose to light to recharge. 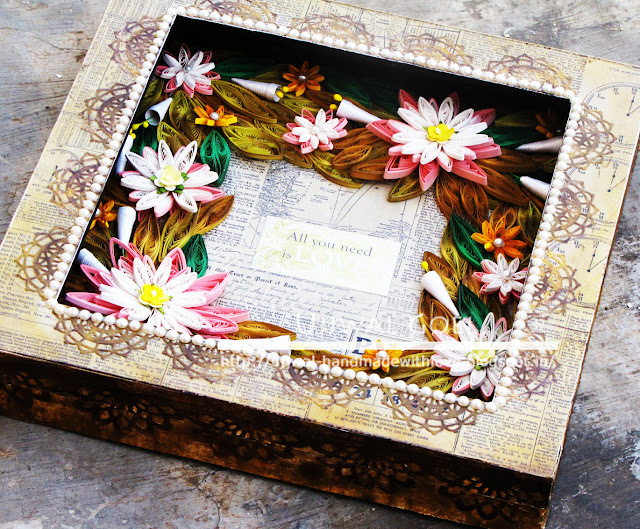 Antique Mod Podge: This is perfect for anyone who loves an antique feel. It allows you to get that aged, vintage look with just one coat. It has a slight brown tint and it comes in a matte finish. Special Formulas to Know There are a few special Mod Podge formulas that don’t do the gluing, but they act as special finishes and are complimentary to all of the Mod Podge products above. Here they are. Mod Podge Super Gloss: You can’t glue with the Super Gloss; the goal here is to get a smooth, epoxy-like finish over a large area. To use, Mod Podge your pieces down with another formula. Then use the Super Gloss over the top. it’s self-leveling and thicker than regular Mod Podge. So it gives you a very shiny, clear finish that looks like epoxy but isn’t (it’s not as thick as Dimensional Magic for those who are wondering).A super shiny, clear finish that is a little bit more thick than regular Mod Podge. Mod Podge Dimensional Magic: Traditional resins give you a hard, varnish finish but are toxic and require mixing – not Dimensional Magic! This product adds an epoxy-like finish to jewelry and paper crafts and dries clear. You can layer Dimensional Magic on top of itself (let it dry between layers). This formula comes in Clear, Gold Glitter and Silver Glitter. Get the look of resin or epoxy without the toxicity and mixing. Dries clear and dimensional. 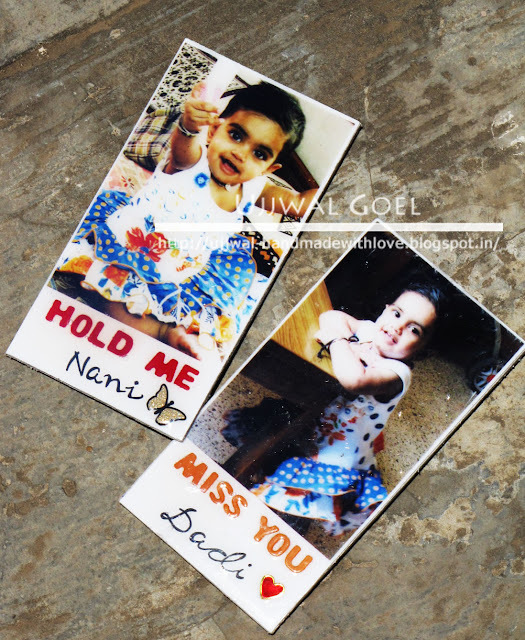 Mod Podge Photo Transfer Medium: Use this medium to transfer photocopied images onto fabric. It works with both black and white and color copies as well as both light and dark fabrics. The formula is water-based and the results are permanent and machine washable (cool water; gentle cycle). Note: I have not used all the above mentioned formulas personally(even though I wish I could own at least one of each type one day :D), but have collected the data over the internet to help you out and get all the information in one place. Out of all the above mentioned, I have had the opportunity to try two of the formulas(Mod Podge Classic Matte Finish and Mod Podge Dimensional) till now and I am super happy with the results. 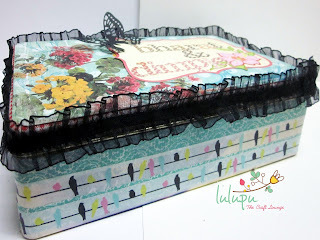 I loved working on this MDF shadow box. All the layers of papers and die cuts were stuck using Mod Podge Classic Matte Finish and then given another coat over the top to seal the surface. The inside is filled with quilled flowers and the center has a space to put a photograph. 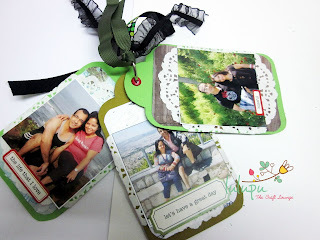 I personally feel that Mod Podge rocks the MDF projects and for me it has become a necessity. 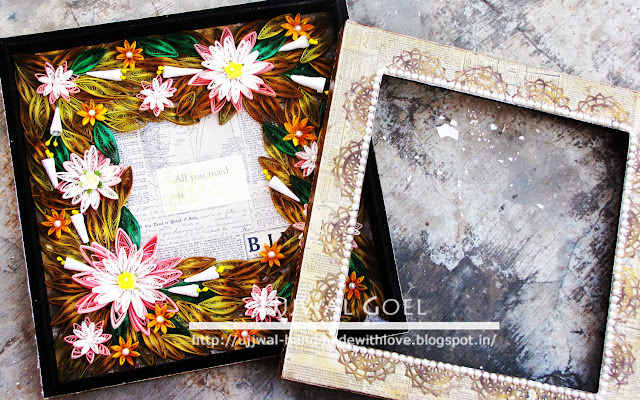 By the way, Lulupu stocks a great range of MDF items that are ready to be decoupaged and turn into beautiful pieces of art. 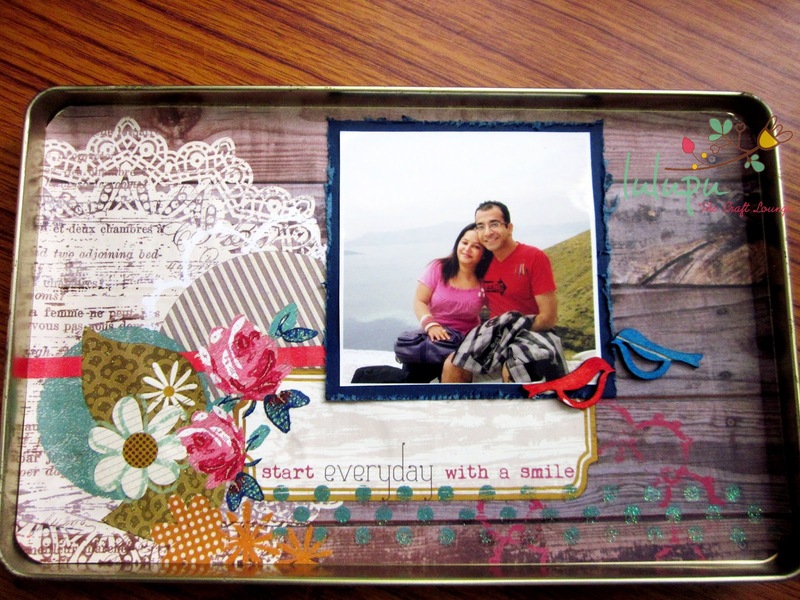 The second project that I did was with Mod Podge Dimensional. These cute little photo magnets were created using chipboard and were a Mother's Day gift for my mum and mum-in-law. I used Mod Pod Dimensional of these to give the magnets a resin like raised finish. - Mod Podge has a tendency to show brush marks. For best results use a sponge applicator/brushes. -For best adhesion, apply a coat of Mod Podge to both the backside of whatever material you are using (paper, fabric, metal, poster, glass, paper mache, wood, etc.) as well as to the front side of the surface. - Allow the first coat to dry for at least 15 mins before you start with the next coat. 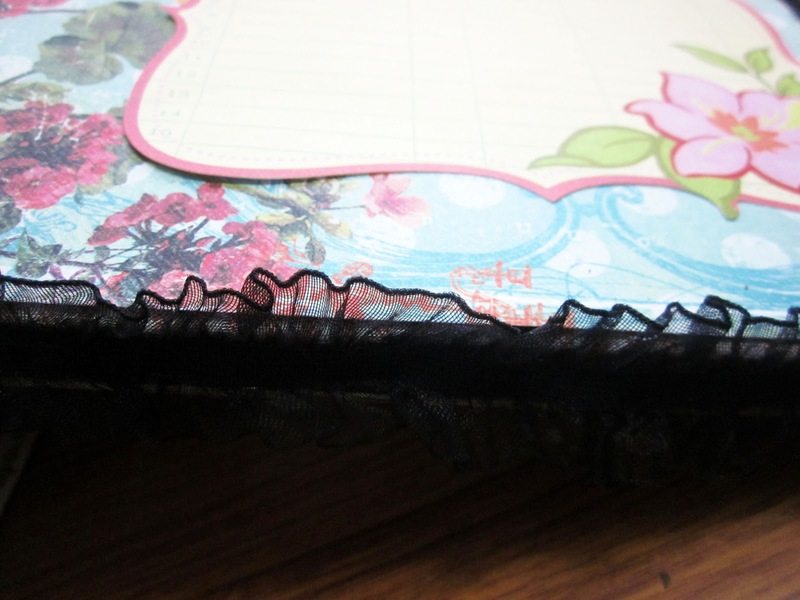 - Surfaces like, paper and chipboard tends to bend a little when Mod Podge is applied. Do not worry, it will straighten out once the Mod Podge has dried. - It helps to use a brayer to smooth out paper and adhere it firmly to the surface. 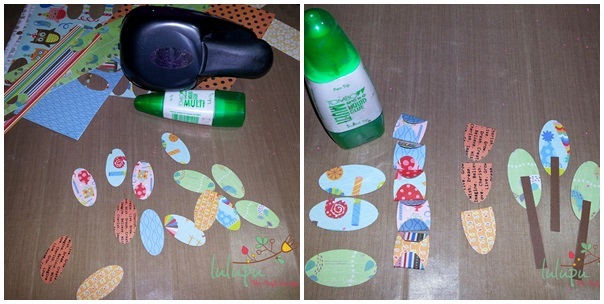 You can also try using Mod Podge Foam Roller Tops. - It is an awesome thing to experiment with and try out new fun stuff. Have fun creating and stay blessed! I am sure you are enjoying the challenge and making projects for your dad this entire month.I am back with my second post of the month an upcycled box to hold pictures and tags.In short it has been upcycled to make a shadow box.hope you like my little experiment with the gorgeous papers from Lulupu and a lot of washi and mod podge.All of the above are available at Lulupu.The washi is so versatile and can be used on any medium.I have applied a layer of mod podge on washi covered tin.The tin wasn't closing with paper.and washi is beautiful enough to hide the tin and thin enough to make the lid fit snugly.serves the purpose. I hope I have inspired you to check out the new collection and old at Lulupu and find out for yourself how versatile you can be armed with Lulupu stuff. Thanks Shylaa for taking time to craft with us, over to you! I am from Hosur, Tamilnadu and working women and a mother of two lovely kids. i have been crafting from childhood and been blogging since a year. Known for Adhiraacreations in blogland. Now I am exploring and expanding it everyday with help of beautiful world of artistic and creative people around. 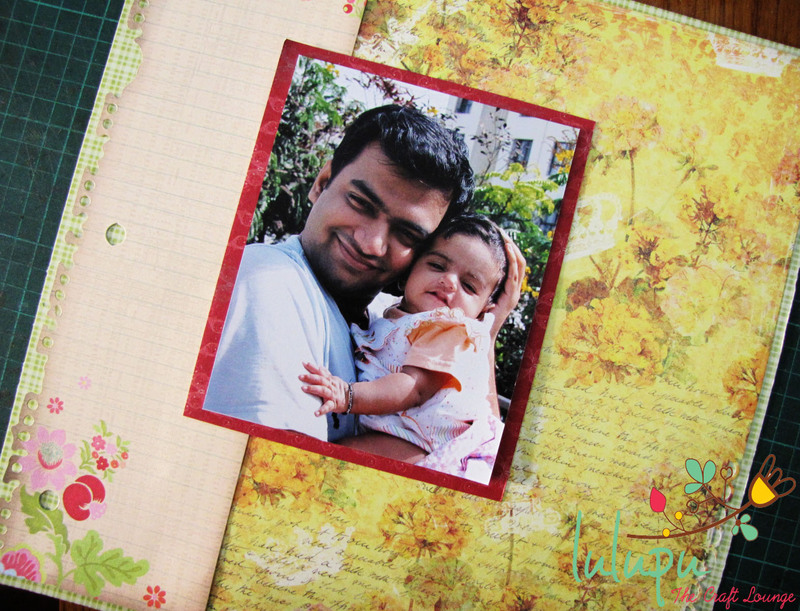 I love paper crafting and feel much relaxed and found myself in a different world. Hope you enjoy my little creations and would love to hear from you! When I got a invitation from Lulupu team for GD, i was really excited and happy. Because i was given the theme My first love - my Dad to create a card. A daughter will always feel great about her dad. He is her first love and first hero. I am here in this blogland only becoz of him. He is a wonderful freehand artist. I was inspired by his paintings from childhood. And the happy part was about My dad’s birthday and my wedding anniversary falls on 4th May. 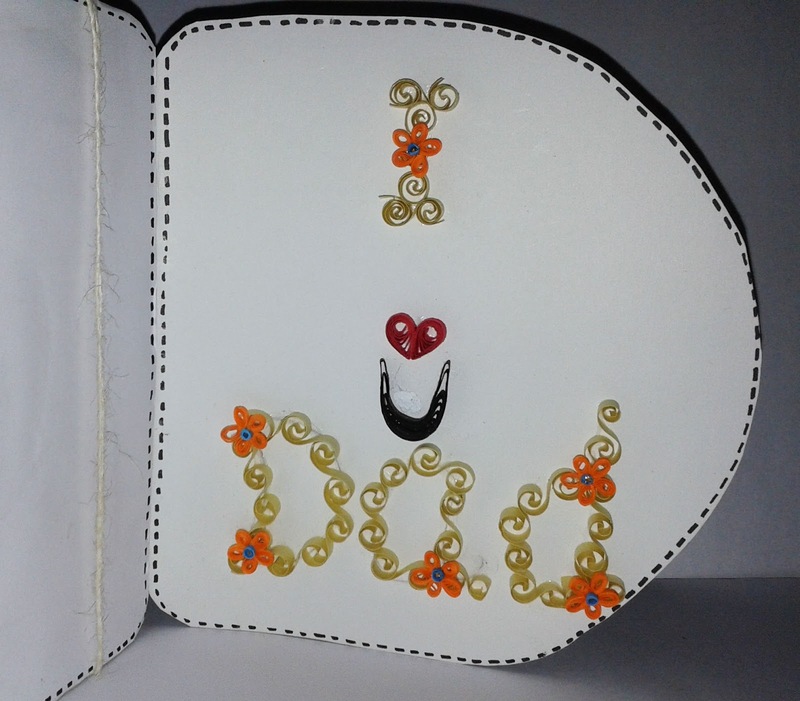 Here’s is my special card for him and for my husband. I decided to use some masculine colours as suggested byt inspiring DT – Blue, brown, beige, orange, etc. Being a masculine card, I felt that it should not be over the top and way to girlie. 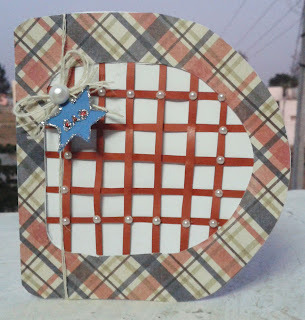 I have created a D shaped card with a weaving pattern in the front. 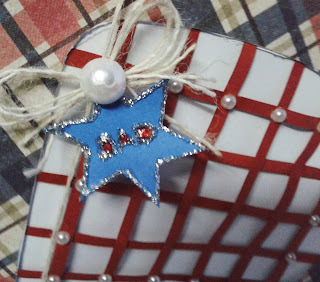 Pasted a pattern paper for the outer D and attached a small star tag to the jute twine and decorated it with white pearls. Added some glitter to the tag with a word “DAD”. Thanks for the Lulupu team for inviting me as a guest designer for May month. 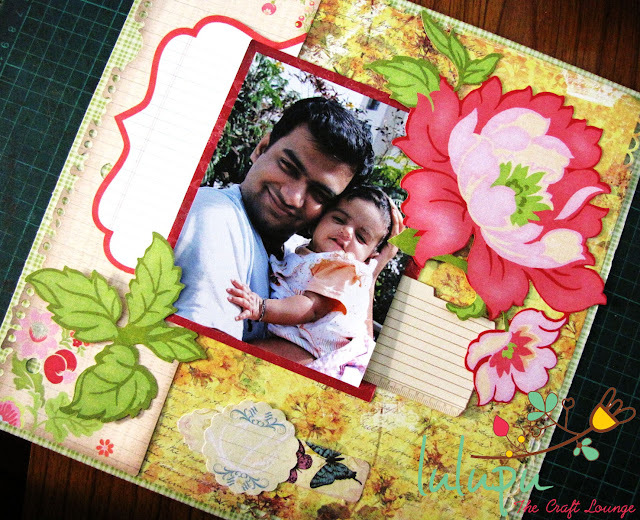 Layering & Paper piecing - A Layout! For the second part of this month, the design team is focusing on "Maximizing pattern papers" and I picked the two very popular techniques with pattern papers - Layering & Paper piecing for the inspiration today. 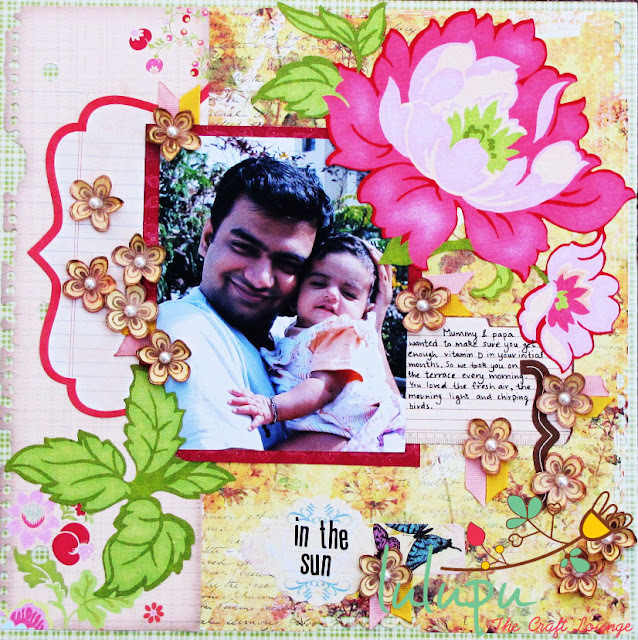 Since the challenge theme is all about Dads this month, I thought it would be apt to make a layout with a picture of my daughter and husband. Once I decided on the picture that I wanted to scrap about, the next step was to pick my papers and I found the perfect one in the Prima Zypher Paper Pad. The bright yellow flowery pattern complimented the picture really well. 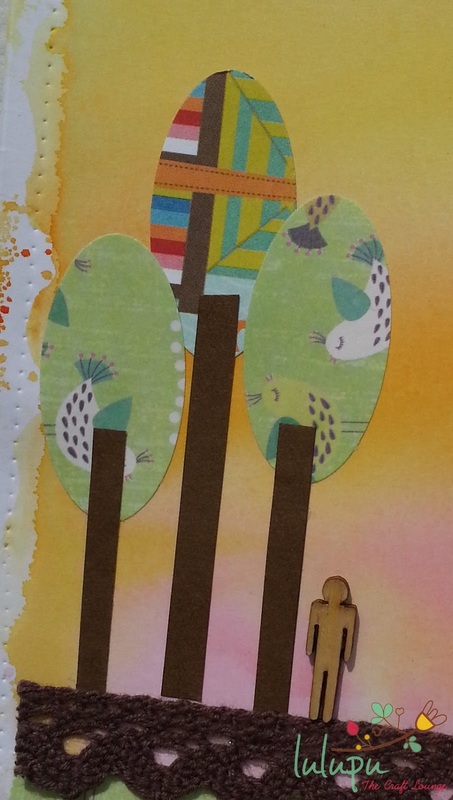 I also picked this large journaling die cut from the K&Company Sweet Nector Die cuts pack. And I layered these two on another sheet of 12X12 DCWV green plaid pattern paper. 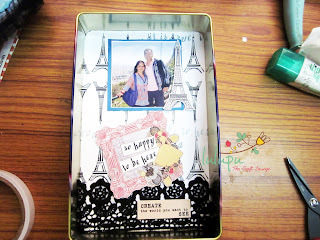 Next I layered my picture on another bright paper from the Welcome to Paris Prima Pad to make it pop on the layout. And then I pulled out more of my favorite die cuts and figured out what I want. Once I was satisfied, I started putting everything together one by one. 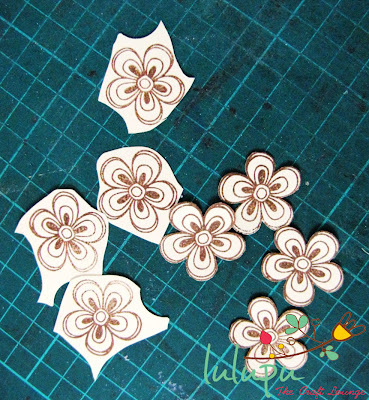 Now is the time to paper piece and make some embellishments for the layout. So I picked my ever favorite Micia Stamp - You are special and paper pieced the smallest flower. Since my background is already so busy, I decided on simple and few embellishments. After the stamping the flowers, I fussy cut them and then treated them with a little bit of glimmer mist to give them some shine. What do you think? Did it inspire you in any little way? I hope you are able to pick up a few little things from this post and give this month's challenge a try. How have you all been? I'm sure everyone's been awesome. I'm really excited to be back. Well, technically, I was never away, but for the past few months I wasn't actively involved in 'creating' anything for Lulupu; just behind the scenes kind of a thing. But from this month onwards, I'll be sharing with you guys again and it feels really good. As we move to the mid year we have some new and exciting news along with some goodbyes to share. 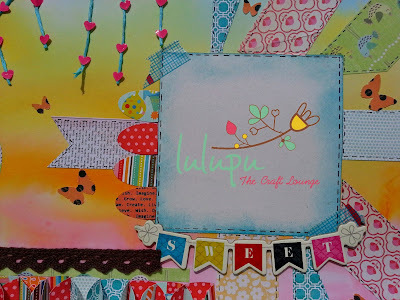 Our DT team has been with us for almost 6 months and its time for Lulupu.com to invite and welcome new and fresh talent to share their love of paper-crafting with the world..... yes we also have many international crafts visiting us every now and then! We will miss our current Design team including Ujjwal, Snehal, Indira and Isha who have flooded us with some of the best creations and amazing tutorials. We wish them all the very best post their time with us here in June! Ability to create tutorials (Picture/Video) and showcasing your ideas and techniques else willing to learn and adapt. 3. 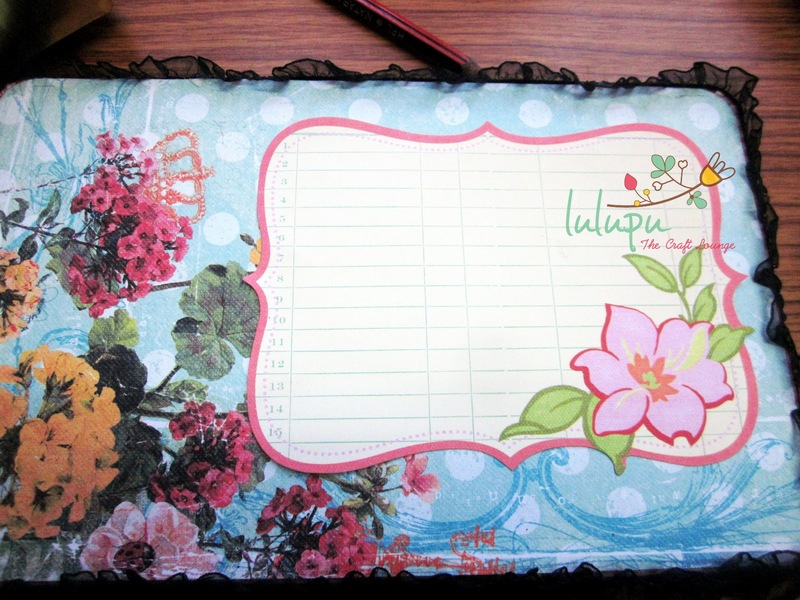 Photos or links to 3-5 favorite projects you've created which showcases your versatility as a crafter. You may add a line or two to describe your projects. Lulupu projects are great, but not required! 4. Any current DT's you are on or have been on. It is absolutely ok if you are on another DT as long as it’s not a Indian Craft Store similar to ours and promoting similar products, we just want to be sure everyone can commit to the DT requirements we have set up. 5. 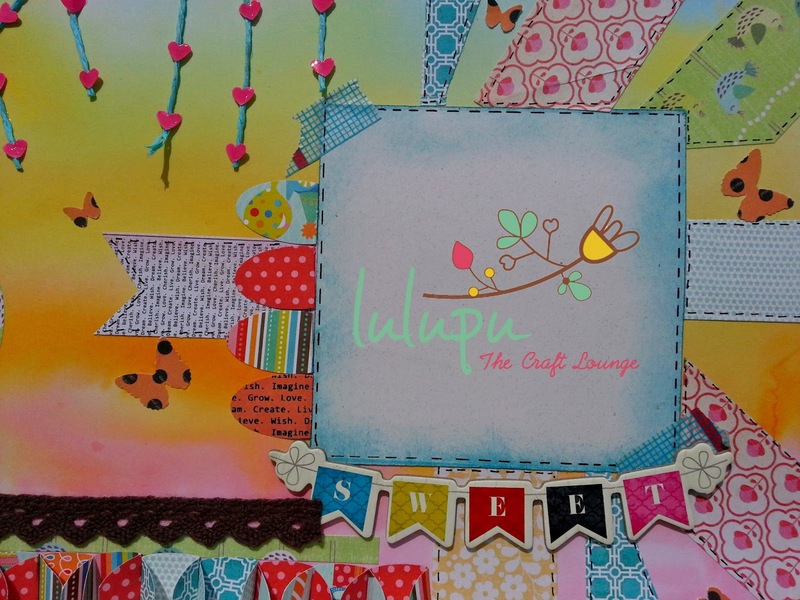 Why you think you'd be a great fit for Lulupu - The Craft Lounge! 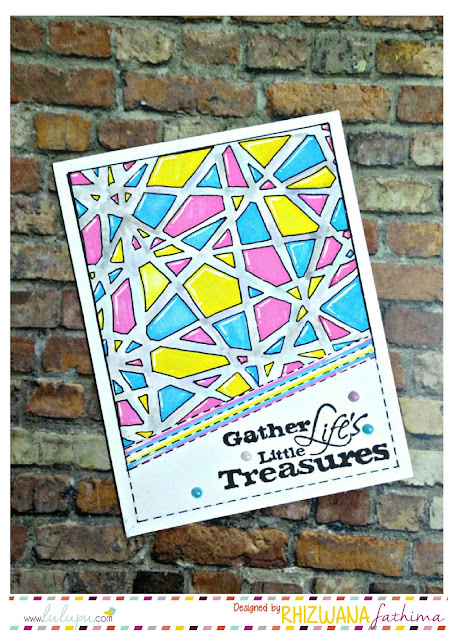 This call is open to ALL paper crafters - we'd love to see what you've created! Please let us know any and all electronic cutting software you are familiar with and have access to (if applicable) along with the craft supplies you currently work with. This call will remain open until May 20th - 11:59 pm IST. Selected Candidates will be sent further details before we finalize the team. 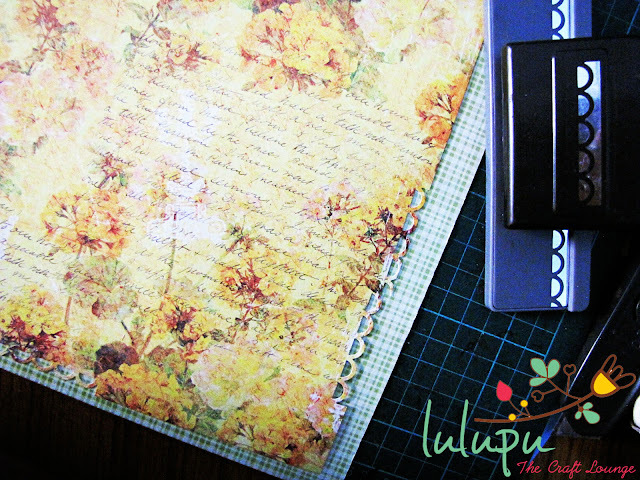 Lulupu.com is a wonderful Online Craft and Hobby store in India to design for! 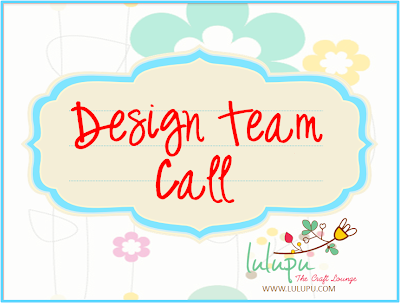 If you have ever wished that you could be on our design team, I hope that you will give it your best shot! You never know... we may just pick you! Lulupu Challenge #12 - My First Love, My Dad!